This is a wholesale/bulk lot of 12 pens. Each individually packaged in a retail blister card, with one set of batteries installed. One inner box of 12 units. This cool little UV pen is small, light, and convenient. 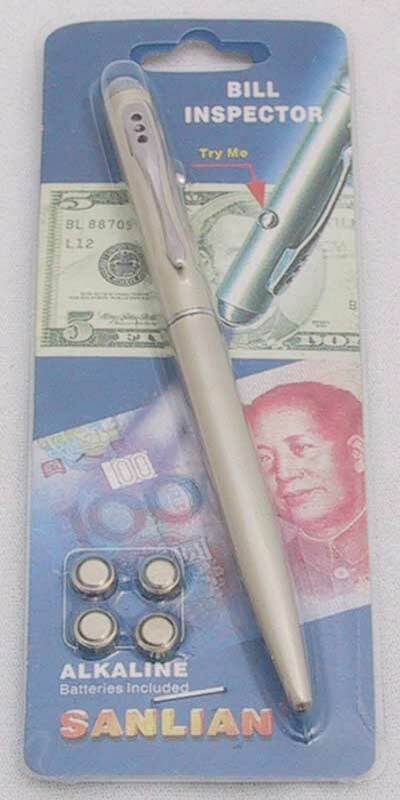 Keep one in your cash box, register, or on you, to check currency or UV reactive ink markings. At around 400 nM, this model is a low cost entry level UV light alternative to our more powerful 395 nM and 385 nM units, making it ideal for kids and some general use applications. It is also ideal for reading hidden text written with UV-reactive ink pens. Uses include: Read hidden UV ink notes; Locate pet stains; identify areas in the kitchen and bathroom which need cleaning (you'll be amazed by what you'll find! ); Identify fake or questionable identification; Check currency. Warning! Please be careful when replacing the batteries. If the electronics part comes out of the pen along with the batteries, it will be VERY difficult to get it back in. 1 Pull pen apart to separate the pen from the flashlight. 3 Push down firmly on the switch button to help hold the electronics in place and shake out the four batteries. You may need to knock the pen on a desk if the batteries get stuck. Note: If the white plastic battery compartment comes out: Remove all batteries from it. Reinsert the empty unit back into the pen with the protruding part going in, exactly opposite of the switch, going above the electronics piece. Use a small screwdriver or any small stick to push it all the way in - about 1/4 inch away from the opening. 4 Take four new batteries and assemble them in a vertical stack in your fingers, with the inside button of each battery facing up. Again tightly holding the button in, flip the pen so that the light is facing up and carefully lower the pen onto the batteries, with the button of the batteries pointing up, towards the light. Be very careful that none of the batteries flip over in the process. Warning! Do NOT attempt to drop the batteries into the pen. If batteries are allowed to drop down into the pen, one or more is guaranteed to flip over! 5 When fully inserted, flip the pen over. Carefully thread the cap in and screw it on. It takes care to align the threads properly and the cap will screw on effortlessly. If you force it on you will strip the thread and ruin the unit. 6 Test the flashlight to make sure that it works. Push the pen back onto the flashlight. Pen: Regular black ink ball-point. UV Light: 400 nM low end flashlight. Batteries: 4 Replaceable AG-3 Button-cell batteries, installed. Replacement button cell batteries can be found here.